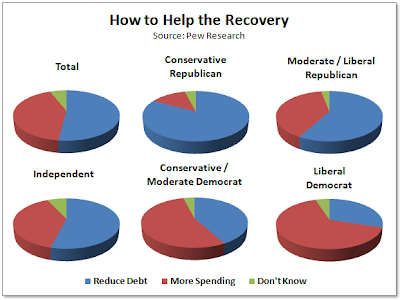 Opinions about how to repair the economy in the United States vary from one party to the next, but broadly trend either toward reducing debt or spending more to in an effort to stimulate the financial infrastructure. The vast majority of conservative Republicans and a majority of Independents advocate reducing debt, while Conservative and Liberal Democrats favor more spending. For more on this continue reading the following article from Tim Iacono. There’s nothing really surprising about the results of a new Pew Research poll in which one party favors deficit reduction to boost the economic recovery while the other party favors more spending, but, it is kind of interesting to see the data all in one graphic. Following the departure of another Republican from the debt ceiling/deficit reduction negotiations, President Obama has injected himself directly into the talks in the hope that some kind of a deal can be struck prior to the debt ceiling deadline on August 2nd. Somehow, the fat tail of a U.S. debt default seems to have grown just a bit fatter.